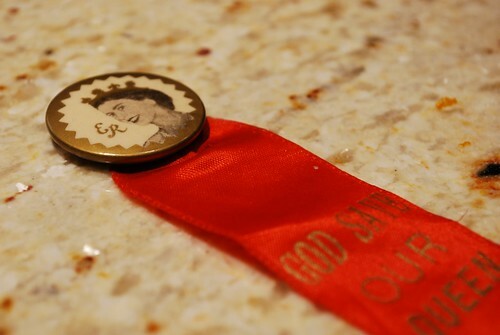 She keeps this pin (and a few other memorabilia) in her dining room next to a framed photo of the Queen. She used these when we were growing up, and my mom was trying to teach me and my two rambunctious brothers our table manners. Whenever we put our elbows on the table, chewed with our mouths open, or used our fingers as utensils, she would point to the framed photo and scold, “What would the QUEEN say! ?” If you’ve ever dined with our family, you can tell that this tactic didn’t work that well, 😉 but how adorable is my mom?!? Okay, so back to the scones. 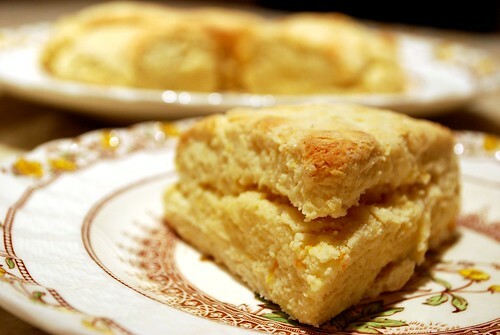 These are the most light, fluffy, and moist scones I have ever tasted outside of the British Isles. What Americans can’t seem to understand is that a scone is NOT supposed to be heavy with a texture resembling that of a brick. What you’re buying at Starbucks is NOT a scone, dear readers, it’s a stone. 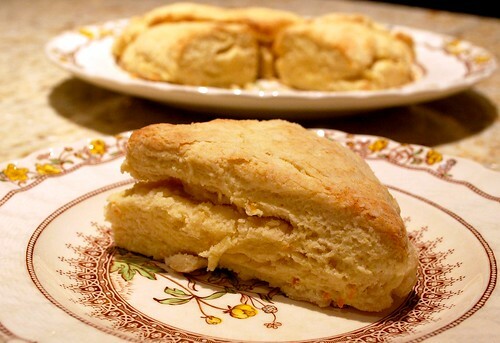 Authentic scones are light as air, with a tender, flaky crumb. They melt in your mouth like a slightly sweet biscuit. They don’t crunch like a piece of biscotti. I was so excited to find this recipe on Four Obsessions – it comes straight from her “British mum.” I substituted cream for milk and shortened the baking time just a tad. Preheat oven to 425 degrees. 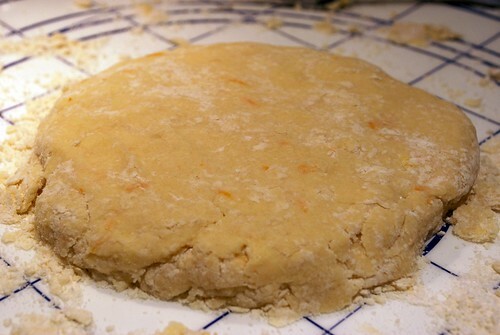 Sift together the flour, baking powder, salt, and sugar. Cut in the butter until it’s chunky. 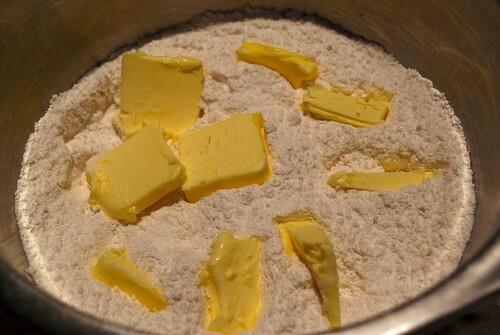 Then use your fingers to flatten the buttery bits into flakes, but don’t over-do it. 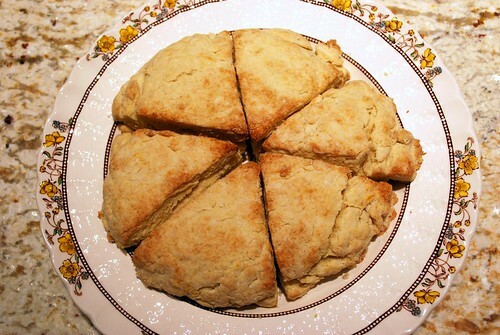 It should not be as fine as cornmeal (like when you’re making biscuits) or else your scones will be heavy. Stir in the dried fruit, if desired. Combine the cream and the egg, beating lightly. 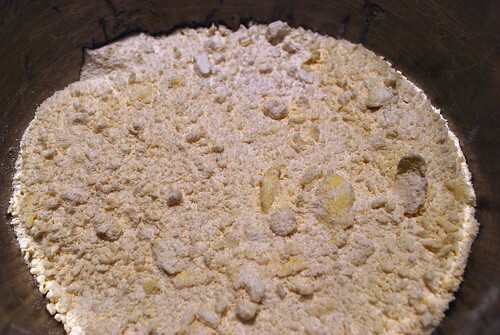 Add to the flour mixture and stir with a fork very lightly. 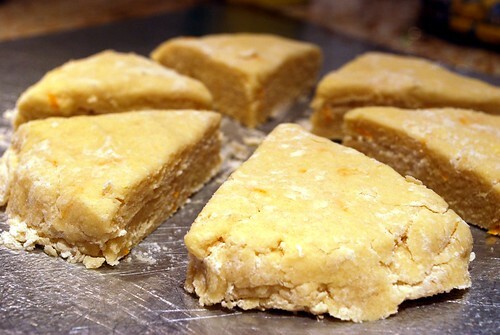 Turn the crumbly dough out onto a floured surface and knead gently 5 to 6 times, just until the dough comes together. Pat into a circle about 1-1.5 inches thick. Use a sharp knife to cut into 6 wedges. Place the wedges on a greased cookie sheet, and bake for 12-15 minutes. The tops will turn lightly golden. Allow to cool for 10 minutes. 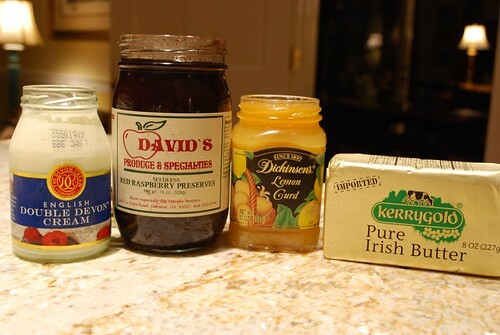 Serve warm with clotted cream, butter, jam, and/or lemon curd.